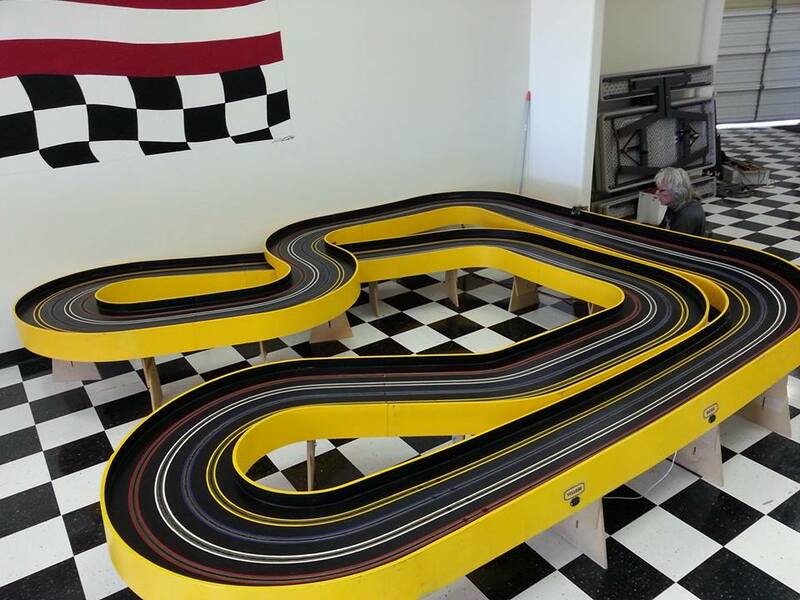 I traveled north 20 minutes today from the San Fernando Valley to visit the area's newest slot car raceway - Wright Raceway located in Santa Clarita California. The raceway has a large 8 lane road course or flat track along with a smaller 4 lane course more suited for 1/32 scale racing. Many Southern California racers will remember the large flat track, formerly located in Yorba Linda. It's a great track, very challenging with many twists and turns. Bob Wright, the owner, is very helpful and knowledgeable. He offers free racing to all the Moms who bring their kids which I think is great. Competitive racing will start in November on Monday, Wednesday and Friday evenings so call the raceway for details. Stopped into Bob's place in Palmdale a while back. Great guy, great place. Good luck on your new location, Bob. Can some one post a picture of the 4-lane track? Here you go although this is not a picture of how the track currently sits in it's new location. The flat track reminds me of one that was in downtown Santa Cruz in the late 80's. Anyone know the providence of this track? The track that Tim's wife videoed in the first segment used to be located at "The Cave" in Yorba Linda, Ca. I nick named it "The Beast", as it is a handful till you get the hang of it. A fantastic track. I wouldn't mind getting over there sometime to try it again. That 1/32 track is better than I would have assumed. Would make a good club track. That yellow 4-lane track is the one Monty Ohren designed & started to build for BPR before he got sick. Good to see them up and running. I wonder if there is a plan for a less technical track for rentals etc. I've raced on that flat track a few times when it was at "The Cave" and I think it's really cool but will be a handful for some, less experienced racers. We had a Farrout club race last Sunday at a member's house in Santa Clarita and a few of us checked out Wright Raceway after our race. There were a quite a few people, adults and kids, all having a good time on the big track. It looked like a few had recently purchased cars there and planned to race in their series. We ran into Heather (of Heather controllers) and Bob Maxwell (from Oxnard) there. A couple of us had brought our scratchbuilt Hardbody cars, and I brought a retro CanAm car, but there was too much traffic to do much with them. We ran some laps on their little 1/32nd scale track with our club cars and that was a blast. But everyone else only wanted to run on the big track. We heard that a third Wright Raceway is planned for Northridge. Certainly worth checking out. it will be interesting on how the track owner run his races and if expert racers (non $ spenders) will come in and scare away the casual racers ($ spenders). Personally, I was a little concerned about his opening the second one before the easy-money "honeymoon" period was even over on the first one. At some point, he'll start having to work for his business rather than just take advantage of the early (easy) traffic flow. As Tony mentioned there is a formula that is (sadly) repeated almost every time and this owner seems to be flirting with that formula. IAC......it may work out and I sure hope it does. One thing for sure is that the greater So-Cal market has been under served for some time. That alone may indicate an opportunity for success. I just hope that when the inevitable slowdown comes at each track, that the owner has the time to work on promotion.......b/c he'll need to.